Enjoy an array of amenities and convenient access to the Fort Leonard Wood Military Base and the Lake of the Ozarks while staying at this Saint Robert, Missouri hotel. Whether traveling on business or pleasure, the Best Western Montis Inn offers the highest standard of accommodations and customer service at an affordable price to ensure an enjoyable stay for every guest. 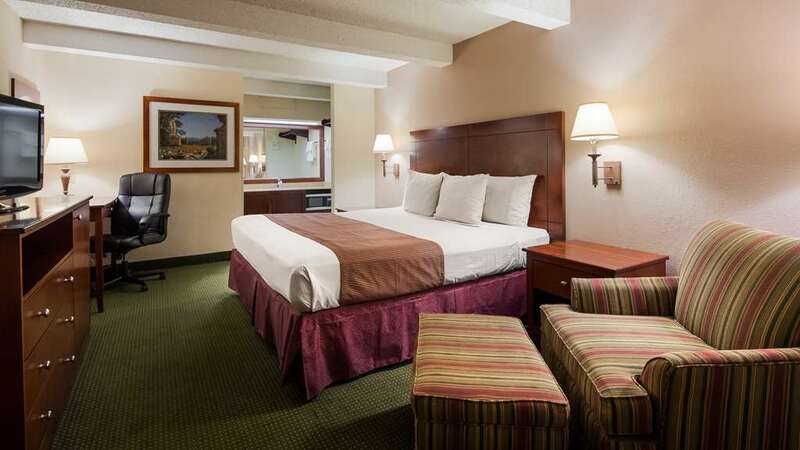 Conveniently situated near central Missouri's Interstate 44, this newly renovated Saint Robert hotel offers 41 well-appointed guest rooms, each featuring cable satellite television and high-speed Internet access. Enjoy a complimentary full hot breakfast each morning before taking a dip in the outdoor swimming pool. This Pulaski County hotel also features guest laundry and business services. Pets are always welcome! The Best Western Montis Inn is conveniently located near the entrance to the Fort Leonard Wood Military Base making the hotel ideal for family visits and graduation ceremonies. Spend a relaxing afternoon exploring the Mark Twain National Forest located right next to the hotel or one of the local museums such as the Fort Leonard Wood Museum or the Waynesville Route 66 Museum. The Lake of the Ozarks, only 45 miles away, offers a variety of outdoor activities including fishing and boating. Guests will also enjoy wine tasting at the Heinrichhaus Winery or exploring the beautiful Onyx Mountain Caverns only a few minutes from the hotel. Saint Robert is also home to a variety of events throughout the year including softball tournaments, tractor pulls and the County Fair. The friendly, helpful staff at the Best Western Montis Inn is ready to ensure a fun-filled memorable stay in Saint Robert, Missouri. Make a reservation today and save! Enjoy your stay. From: Interstate 44. Take Exit 163 (Dixon). The Best Western Montis Inn is located four miles east of Fort Leonard Wood.